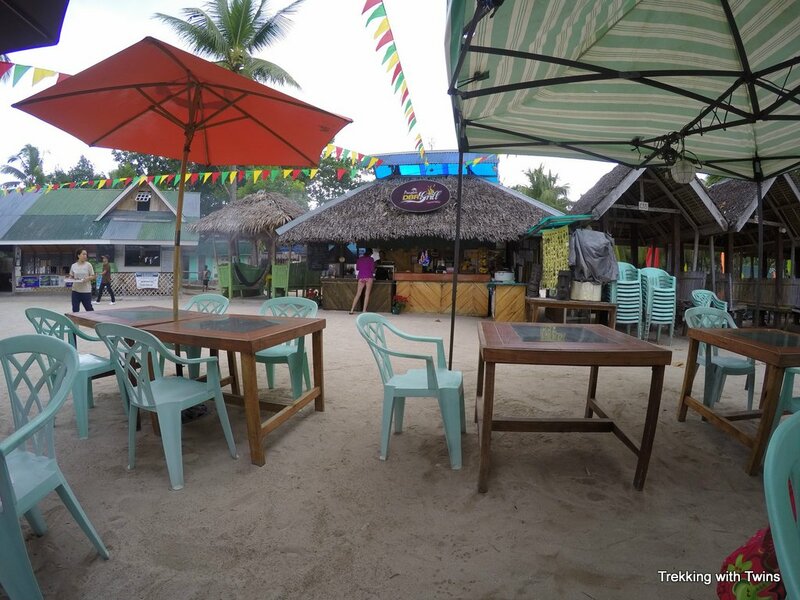 Alona Beach is a fun area to hang out on Panglao Island with lots of restaurants and activities, but when you’re looking for a change of pace and a nicer swimming beach head up the coast to Dumaluan Beach. 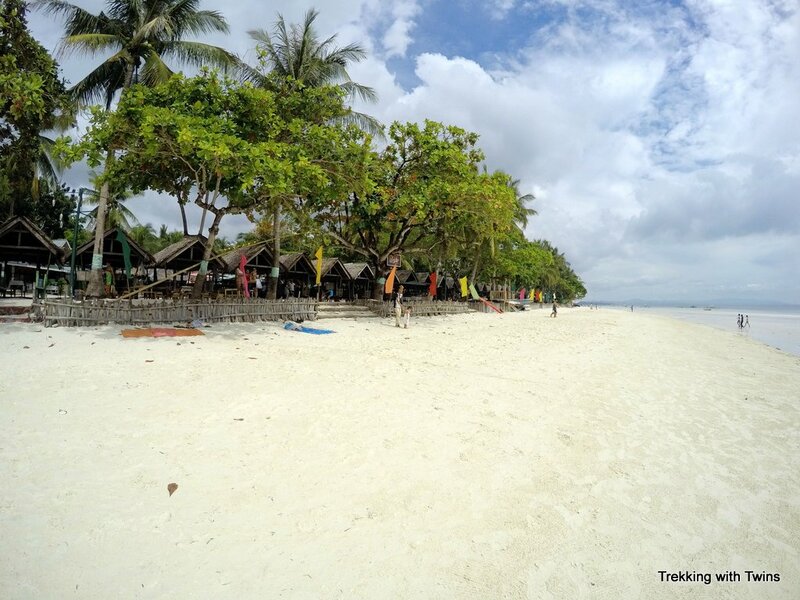 Dumaluan Beach is wide, long, and full of soft sand. The water is shallow a long ways out which is great for kids. Unlike Alona Beach, there’s very few boats so you’re not fighting with bancas for swimming space. We found plenty of shady spots beneath the trees along the edge of the beach and had no problem carving out some space for ourselves. Because of the silty sand the water isn’t super clear but it’s calm. There’s also some grassy areas (watch out for urchins) but on the upside the starfish love to hang out in there and the kids had a lot of fun searching for them (and wearing them as hats). 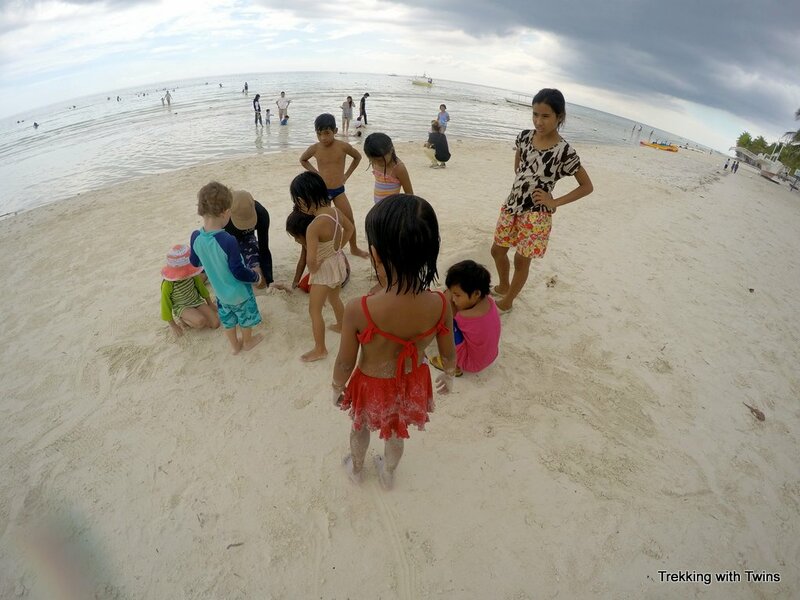 Our twins made friends with the many local kids swimming and running around Dumaluan Beach. We were definitely a novelty and we had a big audience watching us as we built sand castles and pretty much everywhere else we went. There were almost no other non-Filipinos on the beach and we really liked the local atmosphere. 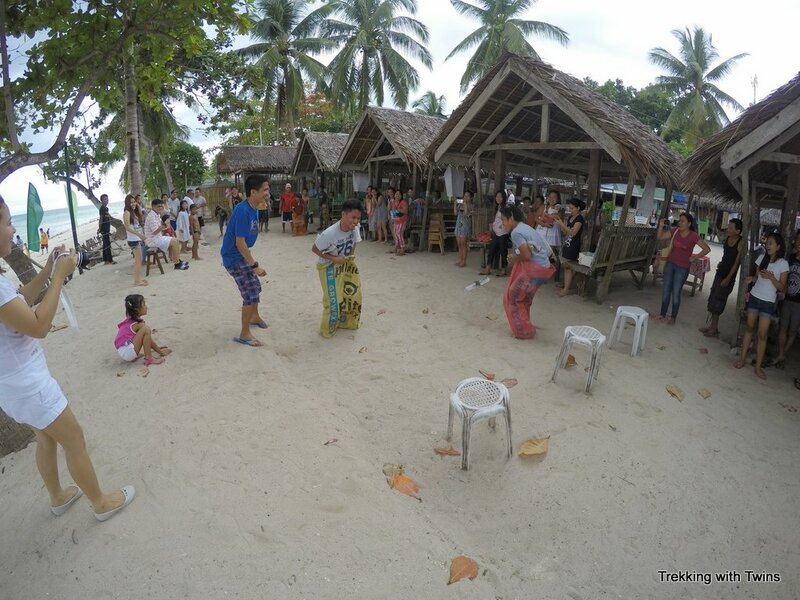 The day we visited Dumaluan Beach happened to be on a weekend which made for a fun atmosphere. Dozens of Filipino families had set up camp for the day in the many picnic table huts along the beachfront. 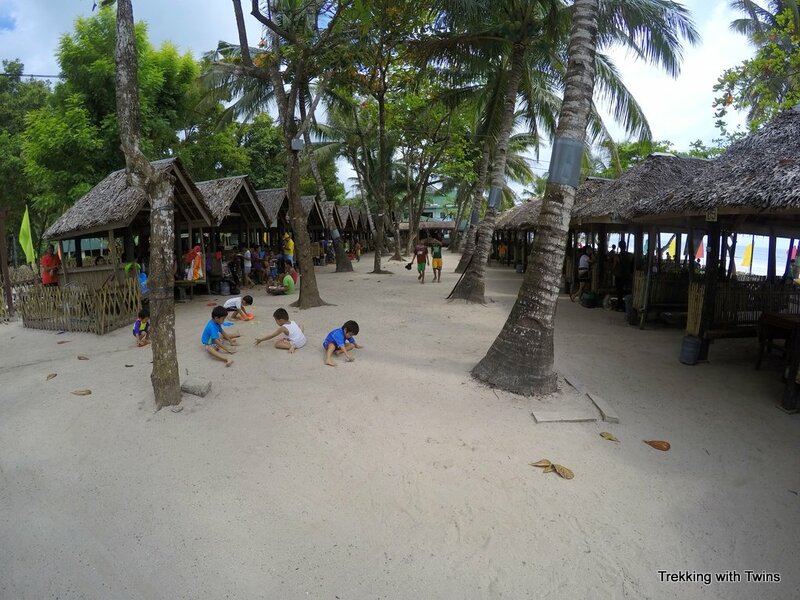 Picnic huts at Dumaluan Beach. We saw folks carting in giant pots of rice and chicken adobo, cases of beer, and even a roast pig. There were piles of fresh fruit and other delicious looking desserts. These feasts were laid out on giant banana leaves that covered the picnic tables. Family feast. See the pig on the left side of the table? In addition to the food these families had the entertainment down as well. We haven’t seen relay races like we saw that day since our “field days” in elementary school. One of our favorites was a sack race with newspapers tucked under arms and between head and shoulder. Everyone was roaring with laughter and just having a blast. It was refreshing to see so much genuine family camaraderie. Here’s a video to give you a better idea. 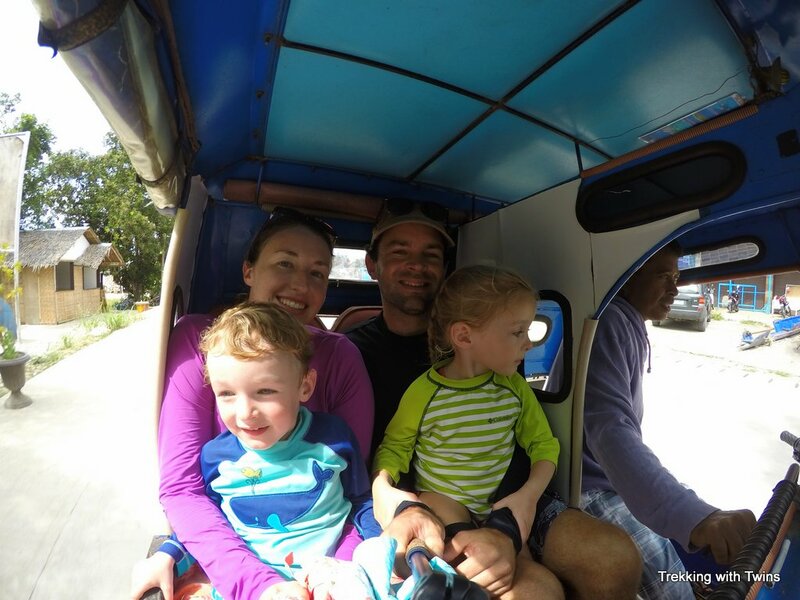 We hired a trike from the main road in Alona to bring us to Dumaluan Beach and then return to pick us up at a specific time. The roundtrip fare was 250 pesos. Riding the trike to Dumaluan. A bit more cramped than the Boracay version! You might be able to find a trike to bring you back without setting it up ahead of time, but the beach is a long ways off the main road so we didn’t want to chance it and have to walk. Access to the beach is through a recreation area (where the covered picnic tables are) and you pay a small entrance fee. It cost 70 pesos for the four of us. You can rent the picnic tables as well for an additional fee. 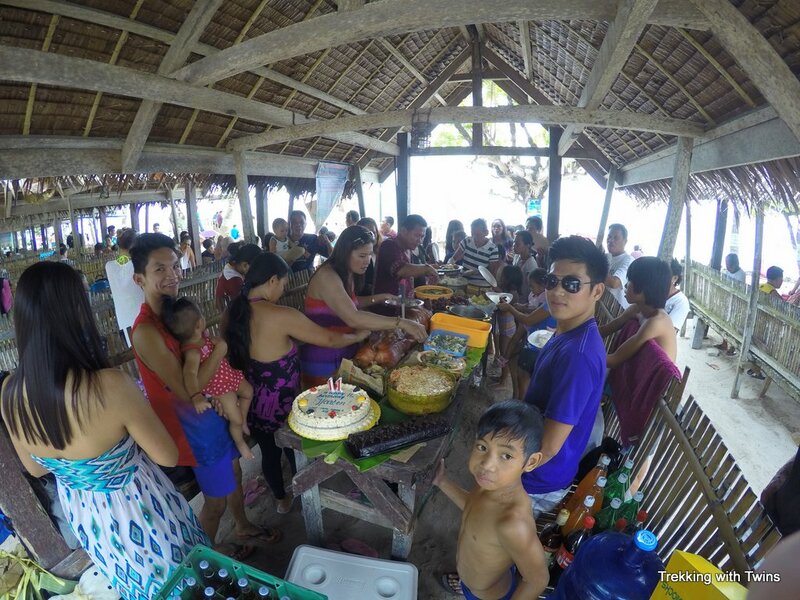 While most of the local families enjoying Dumaluan Beach had brought their own lunch feasts with them, we were not as well prepared. There are basically two options for buying food. There’s a very nice resort adjacent to the recreation area and they have a restaurant with relatively high price tags. There’s also a small cafe in the recreation area that serves a variety of Filipino dishes at bargain prices. We opted for the bargain route and were not disappointed. We ordered some sandwiches to share, some fresh calamansi juices, and a pineapple shake (which Kate turned into a makeshift pina colada with the flask of rum we’ve taken to carrying in our backpack). We also ordered a plate of pancit bihon, a typical Filipino noodle dish made with glass noodles, a variety of vegetables, and pork. The pancit turned out to be enormous (and delicious) and more than satisfied our hunger. All in it was a huge lunch for 500 pesos (about $10). 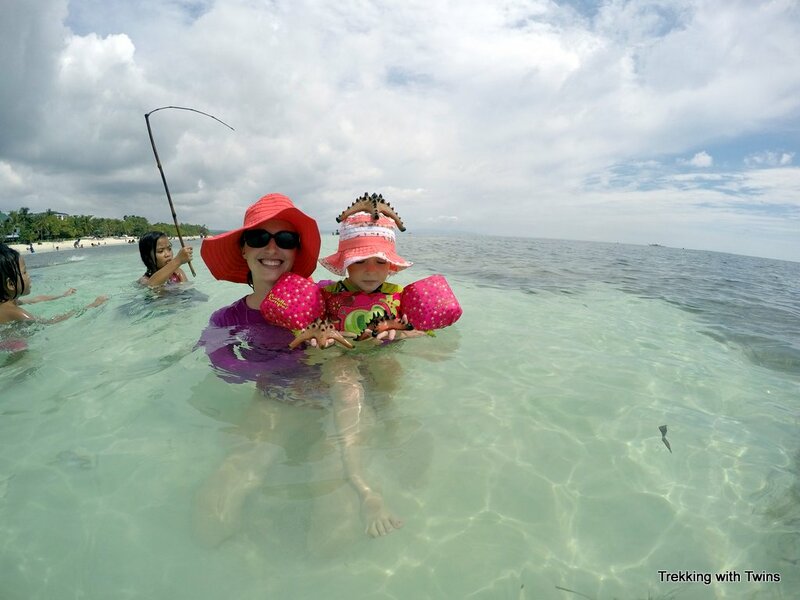 We loved staying near Alona Beach but missed the wide beach and great swimming of Boracay. While not quite Boracay White Beach, Dumaluan is a great alternative to Alona for a day of sun and swimming on Panglao Island.